Battle Angel Alita: Holy Night and Other Stories Review – AiPT! A great companion to a classic series. Battle Angel lovers rejoice as another extra volume from Kodansha is worth a look. This book uses the same extra large hardcover format as the other volumes that make up the series. It also contains four lesser-known stories, creator notes and reflections, and a timeline. This deluxe volume includes four classic Battle Angel Alita stories never before published in English, plus special bonus material! At long last, complete your Alita collection! 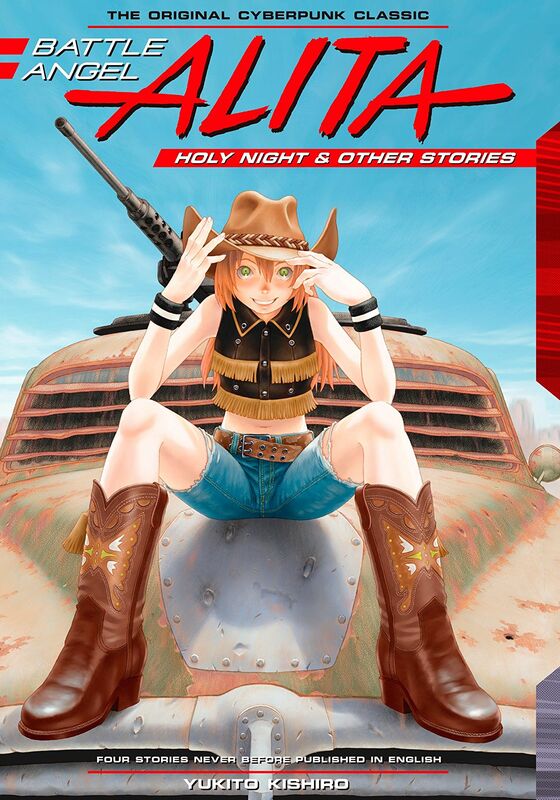 This volume contains four manga short stories by Alita creator Yukito Kishiro, first published in Japan from 1997 to 2006:* Holy Night * Supersonic Fingers * Homecoming * Barjack Rhapsody Plus exclusive bonus material! For Battle Angel completionists this is going to be a must-purchase to fill out the collection of five deluxe editions Kodansha has put out over the last year. It’s also a perfect time to read up as this collection offers a prequel to the first volume, and by association the film as well. This is part of Kodansha’s release of the series in beautiful hardcovers. Check out my reviews of past installments here: Volume 1, Volume 2, Volume 3, Volume 4. This book opens with a timeline which is incredibly helpful given the many things Alita went through, plus it shows how the world became as it is in the story. Battle Angel fans will also note that Alita had a life prior to the original series, making this timeline very helpful. From there this book contains four stories: a compelling prequel focusing on Ido, a story about Alita fighting a nearly unstoppable sniper-like force, a silly Deckman story, and finally further adventures of Koyomi and the skyscraper-sized Barjack. This is a particularly nice collection because it gives readers an eclectic mix of stories set at different times in the series . My favorite of these four stories is the Ido focused prequel story. It sheds a bit of light on Ido’s exploits prior to meeting Alita as well as explains where she got her name. The story ends up being a touching tale that ends in a dramatically sad fashion. It’s a great example of how Yukito Kishiro taps into the humanity of these cyborg, or sometimes fully robotic, characters. The Alita focused story “Sonic Finger” is the second tale in this collection and stands out as one of the most visually striking stories. There are shots of Alita fighting, posing, or just looking badass that stick with you. I wouldn’t be surprised if panels from this story inspired shots in the upcoming film. “Hometown” is the third story and it’s a shorter one focused on Deckman. It’s a strange looking robot that’s a bit goofy but not to be trifled with. This story reveals how Kishiro toys with the futility of things. Finishing off this collection is “Barjack Rhapsody” which adds new layers to the Koyomi character. I never understood her while reading the main series, but her drive and seriousness in photography are compelling here. There is a strong message about finding a craft and sticking with it that is bound to inspire people of all ages. This is obviously not to be read if you haven’t read Battle Angel. There isn’t much context to set up the stories nor where we might go from here. The Deckman story is a bit odd and very short, making it the weakest of the bunch. Overall though I enjoyed everything here. An excellent accompaniment to the main series. This is a beautifully drawn book with different types of stories that should satiate fans of action, thought-provoking sci-fi, and tales about finding our humanity.